I am new to Mac OS (2014 Macbook Air). I am looking at the arrow on top right corner of windows, when I click it, it maximizes window over the top menu and in order to switch back I need to hold mouse in top right corner in order for menu to appear and the button with arrows appears again to [kind of] minimize back as it was. Is there a shortcut key to switch between these modes ? I could only find the Command+M shortcut which completely minimizes the window. The button in the top right of each window is not for minimizing and maximizing the window, but for putting it in and out of fullscreen mode (which is why it covers the menu bar, as you said). 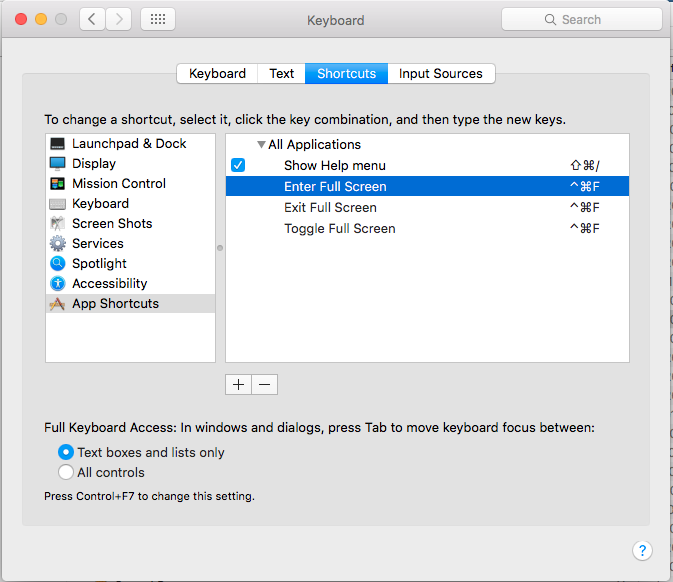 The keyboard shortcut to toggle fullscreen depends on the application. Most applications that I use on a daily basis (such as Google Chrome, Terminal, Mail, and Safari) use ^+⌘+F (Control+Cmd+F) to toggle fullscreen mode. Unfortunately, not all developers use this shortcut in their applications. iTerm, for example, uses ⌘+Enter to toggle fullscreen mode. If the application you refer to does not use either of these shortcuts, you should look for the fullscreen option in the View menu or by searching for "fullscreen" in the Help menu. I did the following and chose CMD+CTRL+F as shortcut and worked on OSx 10.8 and upwards. As you rightly said, applications like iTerm use this menu option, rather than Enter/Exit Full screen, but assigning to the same key makes it somewhat universal. If you find an application that has full screen and isn't covered by the above shortcuts, add the menu item as above for that Application and again assign to the same short-cut key and all should be good. Take 3 fingers and swipe across your trackpad from left to right. That will get you back to the desktop real quick..not minimize the window completely. it accomplishes the same thing though and i prefer this method better cuz you can get back and forth from page by just a swipe back and forth.. Mine is set to fn+F1 to toggle fullscreen on/off. I can't remember if I set it as this, or if my mac came with it set as this. I have a Macbook Pro 13" Retina with Mavericks. Not the answer you're looking for? Browse other questions tagged macos keyboard macbook window-manager . What is the shortcut for fullscreen mode in Lion?